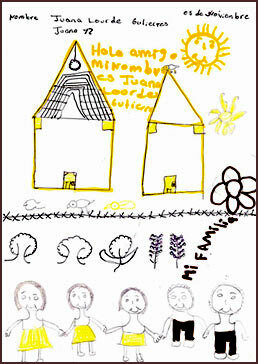 I asked the children in Nicaragua to draw a picture of their “home”. The age groups ranged from 6-16years old and the samples were taken from 2 programs at Accion Medica Cristiana in Matagalpa and Posoltega. In nearly all the pictures there is a strong presence of family and religion. Some of the drawings made reference to the tragic Hurricane Mitch in 1998. When one young boy found out I was from New York City he drew his vision of 911: Two twin towers with a plane approaching.